Pinterest contests are becoming increasingly popular in terms of driving traffic to a website, increasing brand awareness and prompting sales. Do you wish to increase your Pinterest followers? Do you wish to increase traffic to your website? Do you wish to increase sales within a short time frame? Do you want to promote a new product? Do you wish to test the market? Do you wish to increase the subscriptions of your newsletter? 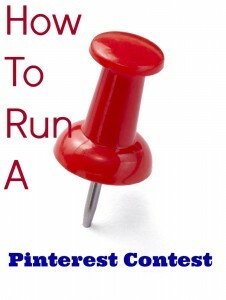 Pinterest have outlined their contest rules now. The two most important things to remember are that the entries are judged, you can’t pick a winner at random and the T & Cs must be clear and on your website. 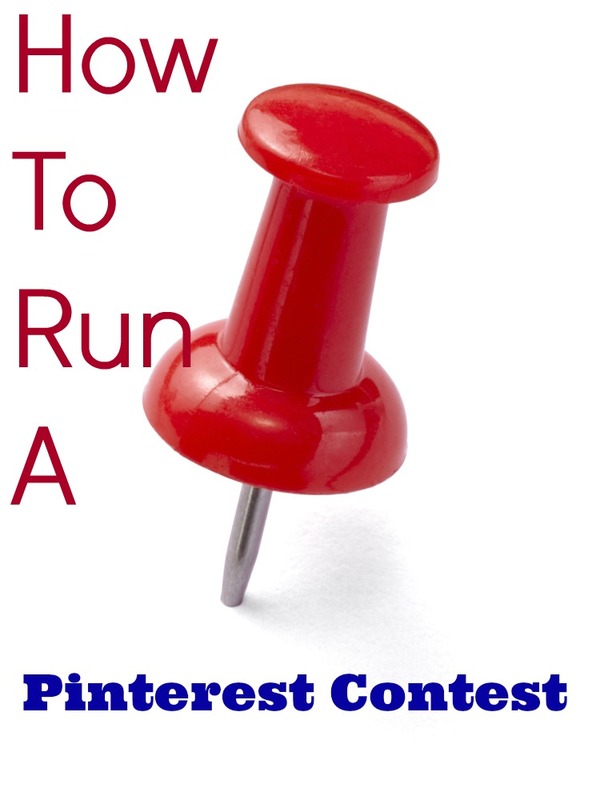 The other thing to realise is that if you are asking people follow you on Pinterest, to create a specialized board, pin items from your website, sign up to a form and give their email address, the prize has to be substantial, otherwise people just won’t enter. 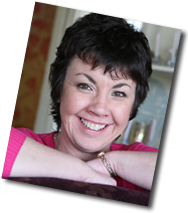 What you wish to achieve is going to be personal to your own business circumstances. For example, imagine you are a fashion boutique and sell online, you send out a monthly newsletter and always see good results from it. You have a good presence on facebook, twitter and pinterest. Your pins are being repinned, they are resulting in reasonable traffic to the website but this could be improved upon. Your items are not necessarily impulse buys (due to cost) but are recognised and quality fashion labels. Your pins may need more compelling descriptions to encourage people to click through to your website. If sales are low compared to click throughs, ask yourself why? Is it too complicated to proceed with a sale? As you use various social media channels, you can utilise them to promote the contest too. How much can you afford to give as a prize? How many newsletter signups and followers do you wish to gain and at what cost? BHG have a substantial following on Pinterest. 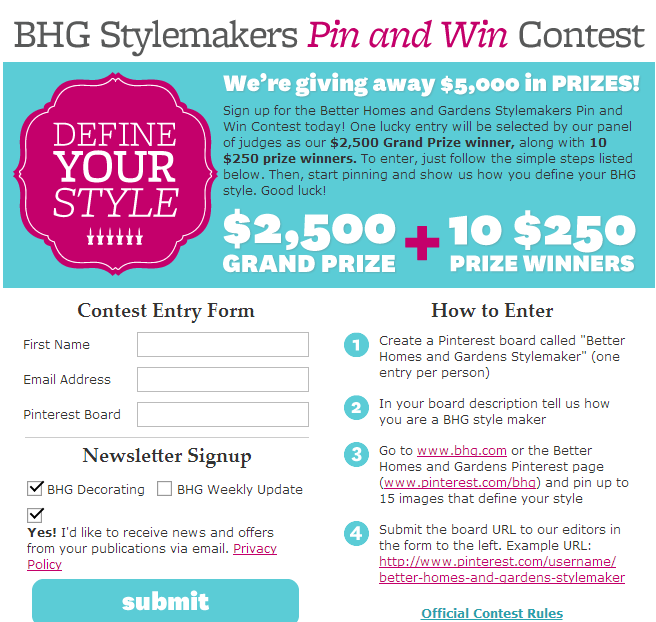 They created a contest that ticked all the boxes above – People had to create a board (named with a specific name), write a specified description for that board, and pin 15 pins from the BHG website or repin from the BHG pinterest page onto that board to showcase their own style. They must submit their board url, their name and their email address (and declick the newsletter sign up if they don’t wish to receive a newsletter) to enter. (The entry form can be created from a plugin on many websites e.g. wordpress) The total prize fund to be won was €5,000 for one main winner and ten runners up. BHG are a very popular brand and have a lot of weight behind them. The prize fund is substantial therefore people will be more energised to put effort into their boards. I notice they haven’t used hashtags at all and for good reason as they tend to be somewhat sporadic in their success. If your following and your budget are much smaller, here’s some suggestions for what I think could work, and yet it would still be similar to what many large brands such as BHG are doing. Add an aspirational prize e.g. A style makeover either instore or online. Ask them to create a board of a specific name and a descriptor. Ask them to pin ten items to that board to create a particular theme or focus, two of which must be from your website. Make the whole concept a fun and seasonal one. They must submit the board url on a form similar to the one created by BHG and ask them to opt in / opt out of the newsletter sign up. 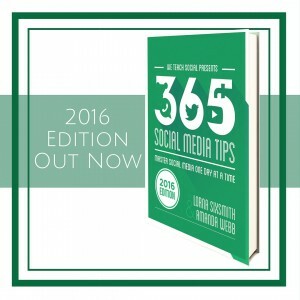 By spreading the word via facebook, twitter, your blog and your newsletter, you will also be pulling in existing followers to engage with you on another social network. Don’t let it go on too long – 2 weeks is plenty. You really have to consider your target market – what gets them excited, what would encourage them to spend some time playing around with pins and creating a new board. If you are a fashion boutique, asking them to create a board that symbolizes the Autumn 2013 look best could work well and your judging criteria would reward interpretation of the latest fashions and creativity. Too much effort on their part and you may be very disappointed with the entries. Ask people to do the minimum to ensure you get your followers and your newsletter subscribers and yet they have fun and the contest can be judged fairly. According to this article, the Huffington Post only received 40 entries to one of their contests but they had asked that each pin had to have captions and hashtags. Also ten pins had to be from the HP website which is quite a lot in my opinion. 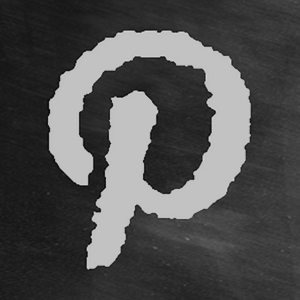 Pinterest contests can be very effective but you must prepare for them with care. If you are interested in learning more about Pinterest contests, this will be covered in our upcoming Advanced Pinterest course which starts on 2nd September. It runs for 5 weeks and is delivered online.